A Bluetooth pressure sensor monitors the useful life of your HVAC filters and pings you when they need to be replaced. Yeah, it sounds silly at first. Who needs Bluetooth in their HVAC system’s air filters? But give it some thought and the idea makes sense. Changing your filters based simply on the date on the calendar provides no guarantee that the filter hasn’t already become too dirty to be effective, and it could mean that you’re wasting money by changing your filter before the end of its useful life. 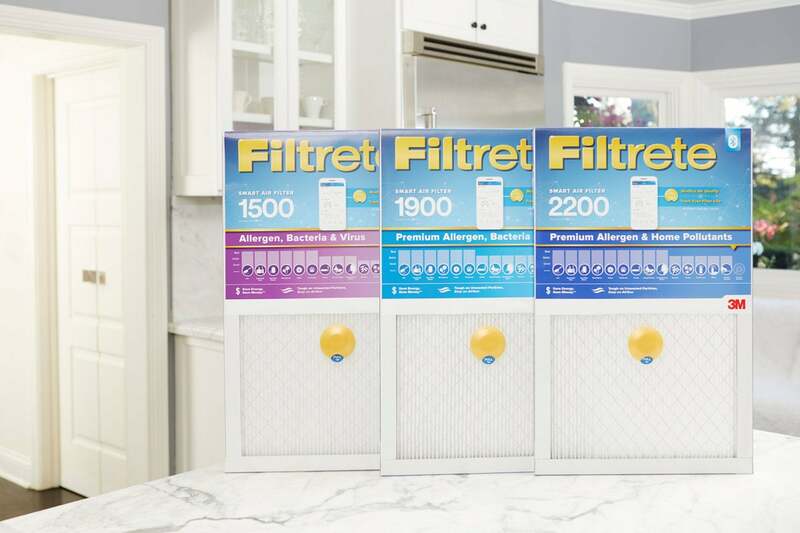 Enter 3M's Filtrete Smart Air Filters. 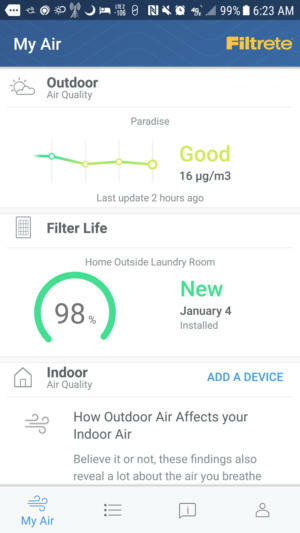 3M's app tracks the useful life of its Filtrete Smart air filters. 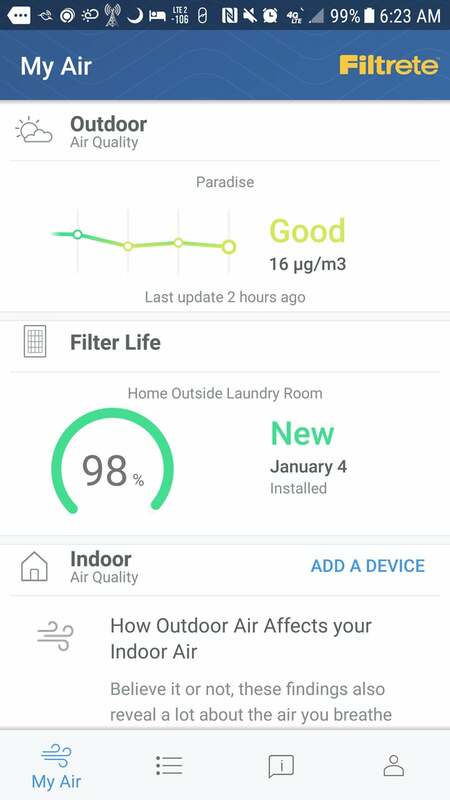 I’ve installed the filters in my own home and will report back in a month or two with my experience; in the meantime, here’s what 3M says its smart air filters can do. Each filter comes with a Bluetooth-enabled pressure sensor that’s paired with a smartphone app. The pressure sensor measures air flow and usage. Air flow is reduced as the filter removes contaminants it until it reaches a threshold at which the app sends you a notification that the filter should be changed. The EPA recommends checking your air filter once a month (and we all do that, right? ), and changing them once each quarter. It’s easy to tell when a filter is very dirty, as you can see it’s gone from a pristine white to a dark gray with dust bunnies clinging to it. But if you wait that long to change it, who knows what kind of junk you’ll have been inhaling in the meantime. When you need to replace the filter, you can use app to find out what size filter you need, and how many you need—the app can keep track of multiple filters at different locations inside your home as well as at multiple properties. Of course, it will point you to retailers where you can buy one. The app provides tracking data on outdoor air quality, too, and it can be configured to warn you when outdoor air quality is low. 3M has also partnered with Speck to incorporate data on indoor air quality as reported by Speck’s sensor device. 3M says the presence of the Bluetooth pressure sensor adds only about $5 to the retail price of its filters (the smart filters themselves are no different from “dumb” filters). They are available at three performance levels: The 1500 series ($21.99 MSRP), 1900 series ($24.99), and the 2200 series ($29.99).